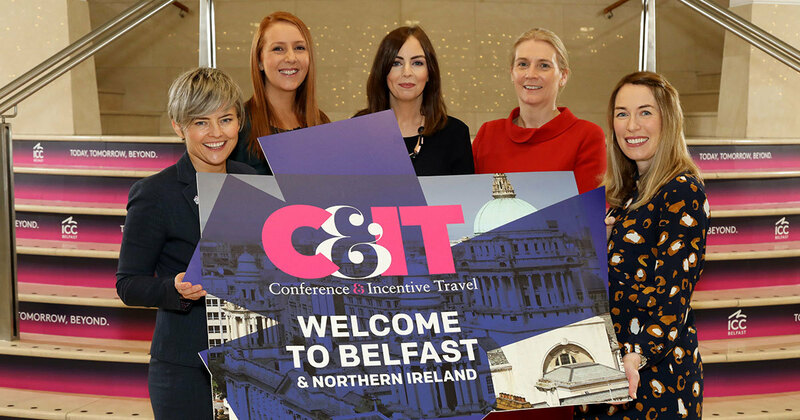 Belfast has been named as the official destination for the 2019 Conference and Incentive Travel (C&IT) Agency Forum. Successfully secured in partnership by Visit Belfast, Tourism Northern Ireland, ICC Belfast, Titanic Belfast and Hastings Hotels, this sought-after event represents a major coup for Belfast, and Northern Ireland’s drive to even more business tourism opportunities in the years ahead. Pictured: Oonagh O’Reilly, ICC Belfast, Laura Cowan, Titanic Belfast, Rachael McGuickin, Visit Belfast, Catriona Lavery Hastings Hotels and Eimear Callaghan, Tourism Northern Ireland. The annual event, which has only been held outside London once previously in its 10-year history, will bring 100 of the UK’s leading and most active event planners and suppliers to Belfast from 29 July – 2 August 2019. Senior planners and managing directors from major UK event agencies will attend the two-day event, which provides the opportunity to meet and network with key industry suppliers. Rachael McGuickin, Director of Business Development at Visit Belfast, said: “This is a major coup for Belfast. These flagship industry forums are attended by many highly influential global event organisers who between them control a combined annual spend on events worth £450 million. The decision by C&IT – the industry leaders – to base themselves here for these pivotal events represents a real vote of confidence in our city. This is a major coup for Belfast. These flagship industry forums are attended by many highly influential global event organisers who between them control a combined annual spend on events worth £450 million. The C&IT Forum is renowned within the industry and attracts the biggest and most successful companies, including “super agencies” like BCD events, Banks Sadler, CWT, Concerto Group, George P. Johnston and Ashfield Meetings and Events. Eimear Callaghan, Business Solutions Manager at Tourism Northern Ireland, added: “Business tourism, specifically conferences and incentives, is emerging as a key priority for the future growth of tourism in Northern Ireland due to its propensity for higher spending visitors, shoulder season business and regional dispersion. The opportunity to bring these events to Belfast follows both the city being awarded the Best Events Destination and the ICC Belfast named the Best Venue at the recent C&IT Awards in London. Calum Di Lieto, Editor of C&IT magazine, said: “Our Agency Forum makes connections between senior event organisers and industry-leading suppliers, and we are very excited to be able to do this in Belfast in 2019. The Forum’s main programmes will take place at ICC Belfast, with additional social events to take place at Titanic Belfast, the Grand Central Hotel and a street party in the heart of the Cathedral Quarter. Buyers will also have the chance to explore more of Northern Ireland through trips organised by Tourism Northern Ireland.